Bernard is an elementary school that has sustained PBS since the late 1990s. The school has a high percentage of students from First Nations/Aboriginal Heritage, and their PBS system includes First Nations artwork and symbols to teach students social responsibility. This handout provides an overview of Bernard’s universal PBS system (S.P.A.R.K.). As part of their PBS systems, Bernard Elementary uses grade levelled SPARK passports to reinforce and acknowledge the positive behaviour of their students. These passports are completed as the students are recognized for their actions and are displayed in the school once they are filled. This handout is a quick scale Bernard Elementary uses for teaching the social responsibility performance standards when integrated into the universal systems. The staff at Cultus Lake have generously provided their PBS handbook for sharing with other school teams. FG Leary is a fine arts magnet elementary school. The school incorporates the fine arts focus into its PBS systems. Included here are some songs, plays and activites. They have been kind to create “generic” versions for adaptation by other schools. FG Leary has also added “online” as a setting in their matrix. Click here to see the revised matrix and the ways that FG Leary has outlined their expectations for being caring, cooperative, respectful, and responsible with online resources and technology. An expectations matrix used to provide specific examples of Lloyd George’s school-wide expectations, S.O.A.R. Thanks to Susie Mabee for sharing this matrix with the PBS community. Click here to see Quarterway Elementary’s PBIS matrix. 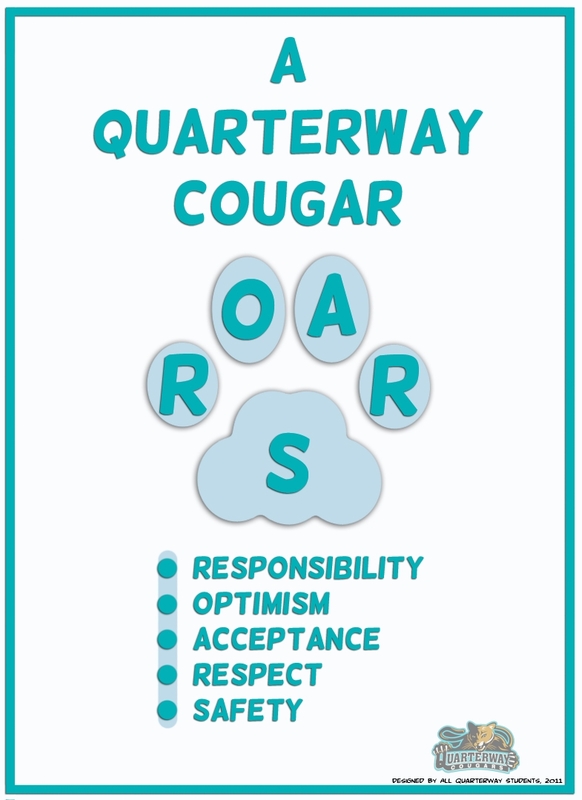 Below is an image of the Quarterway Elementary ROARS poster. Students and staff at Central Middle School created this powerpoint to show how their school is integrating a bullying response program into their PBS system. Results show a reduction in major referrals since its implementation. The Nanaimo-Ladysmith School District has donated these district presentation resources. Quarterway Elementary has donated these PBIS presentations, designed for a variety of audiences.